This is the part5 of my series on Maven, Spring and hibernate put together. This section is where we will actually feel some actions. this part 5 wasn’t planned from start, I introduced this step because it feels to me that there were so much to grab at once if I had published the original part5 (Only God knows how lengthy the original post could be). Instead of plumbing everything at once, I decided to split the plumbing per domain (Family, Person, Profile). 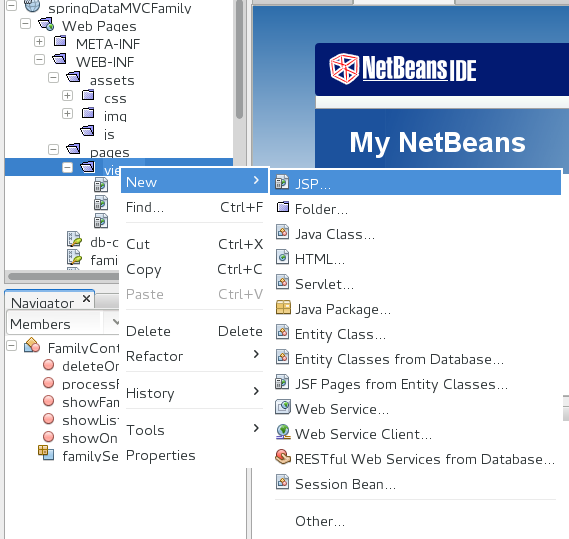 So in this post, we will focus on the Family domain CRUD operations and some JSP section to show how to plumb together back end to front end. What is the use of service layer? With the help of Spring-Data we have database operations covered. In our implementation that data layer is agnostic of whatever logic we want prior to any object persistence. Most of people have another Layer called Service Layer in which they put most of the Business Logic. * Method to pull records from the database page by page with the help of the number of records per page. * @param pageSize total number of records per page. The hibernate Validator is to help us set validation rules right on the class itself. Here we have used @NotEmpty to prevent submition of empty textbox. This together with spring will raise a flag when the submitted form doesn’t meet the validation rules and the form is usually sent back to the front end interface with the validation message when it’s configured properly eg : “Sorry Dude, Name can’t be empty”. 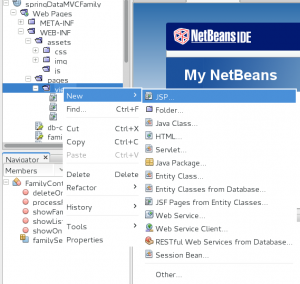 In case you might want futher insight on Hibernate Validator, head to jboss documentation site for a little tour. In order to give some kind of feedback to the end users I have created a success View which takes advantage of RedirectAttribute that I will explain later. Create, Edit, and Delete of our CRUD make use of that action to display some meaningful answer. 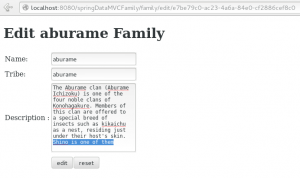 In the action above, we have created an instance of FamilyForm object and assigned the key “familyForm” name to it when adding it to Spring org.springframework.ui.Model which would be responsible of making our form available to the view. In the view we will thus refer to the form by “familyForm”. BindingResult is used for error registration, I mean by that any validation error. Together with ModelAttribute allows the display of the error of the field whose validation failed. RedirectAttributes It’s use to register the message for the next redirected url. Again you can read more on these on your own later. Let’s Create the record again with correct with all requirements. After adding a couple of other families, Let’s decide on which one to edit. Here again we need to show the form before processing it. So we will need 2 actions to complete this steps. 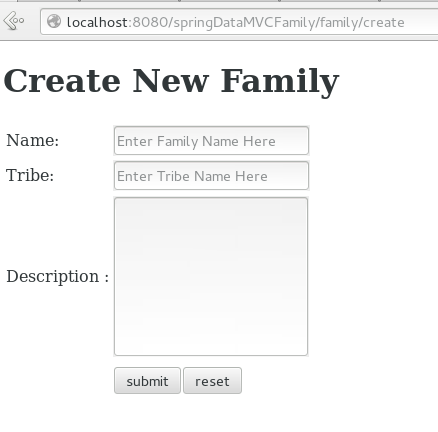 In a number of actions in the FamilyController I only returned the name of the view file and used org.springframework.ui.Model to send data to the view. But for EditOne action that we will create below, I deliberately used another technique which is ModelAndView. That is me showing off totally … well a little. Fact is I wanted to show how things could be done differently and for there is no actually preference in returning a view name or a ModelAndView instance. See below the snippet of the action. Here we needed to pass to the edit method the ID of the item we want to edit. We have chosen to include the id in the url (REST way or cute url) as opposed to have a query string “/family/edit?id=blablabla”. For that to happen we use spring annotation @PathValiable and together with spring helpers that id becomes the argument of our action method. We went to fetch for the actual record and created a form out of it and then sent it to the View through ModelAndView, but it could be via the simpler Model object we have been using so far. Notice that this time as well we used “form” as Model attribute so our annotation of @ModelAttribute would be “form” as opposed to “familyForm” it’s just a matter of choice. Let’s click on the edit link of one of the items of our family list page . 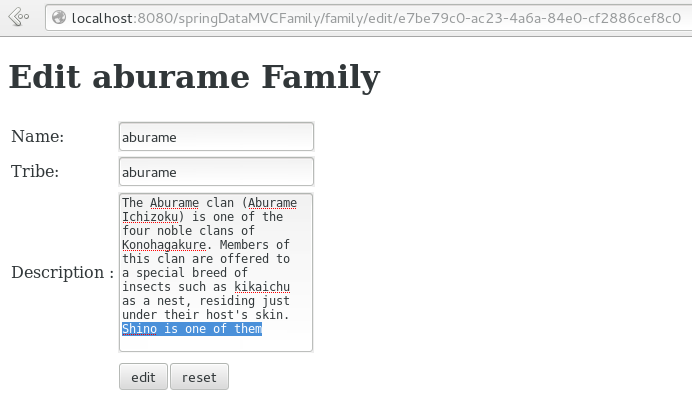 In my example I will use aburame’s clan/tribe. Deleting an object is a little similar to the edit part in the sense that you need to point out what exactly what to edit or to delete. We have actually in the familyList.jsp included the link to those actions so that it reflect the rule we have set with @MappingRequest for a particular action. Here we tried deleting the family by its ID assuming the object of that ID is actually there which could be wrong BUT we put the code in a try and catch block then we caught the exception of it not being there. Check the EmptyResultDataAccessException catch block. So that’s all folks, I hope this is not too long and boring. This is real practice time so I hope you enjoyed it ^_^ .